With a group of 100 guests gathered together for a recent fundraising dinner, Children First Chairman Roger Langley took advantage of the occasion to introduce three new Foundation Patrons. 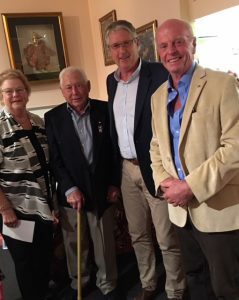 Roger announced that he was delighted that Mr Noel Baker, Mrs Gerry Lamers AM and Mr Bernie Lamers AM had accepted the Board’s invitation to join the list of Children First Patrons. Many of the guests in attendance were Rotarian friends of Noel and Gerry and husband Bernie, and long time friends and supporters of Children First, so the announcement was met with huge applause. The occasion was a Charity Dinner at Suwan Thai Restaurant in Lower Plenty, generously sponsored by owner Woody Suwan, and organised by Gerry. Woody donated the hospitality of his restaurant to raise funds to purchase equipment for the Foundation’s new physiotherapy room at the Miracle sMiles Retreat. After guests enjoyed a sumptuous Thai feast courtesy of Woody and his staff, auctioneer Morrison Kleenan enticed generous bids for an array of auction items. Foundation Patron Margaret Smith OAM and members of the Foundation Board were also among the guests. 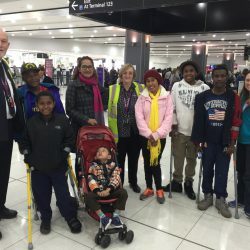 Noel Baker is a former Board Director whose relationship with Children First began through his connections with Southern Mitchell Rotary. Noel and wife Janice donated the land beside their property, where the Miracle sMiles Retreat is situated. He was involved in the building of the home, and over the years has liaised with tradesmen on other projects on the site such as the Cabrini Barn and construction of the sheds. When there were issues with water pumps, the dam, the driveway, Noel was on hand to fix or advise. He also maintained the Retreat vehicles. He helped protect the property on Black Saturday when fire threatened to engulf it. Noel continues to provide sound advice and support. Gerry Lamers has also been associated with Children First from the beginning. She established the Labour of Love Auxiliary which comprised around 30 ladies, known as ‘Gerry’s Girls’ many of whom were senior citizens! They held market stalls at large shopping centres several times a year, stocked with items they sourced, sewed and knitted. They sold Christmas cards and promoted Foundation events. Together under Gerry’s leadership and encouragement they raised a total of $202,550. Bernie Lamers is a builder, and member of Preston Rotary. With Rotary 9790, Bernie was a key figure in the construction of the Retreat (formerly the Farm). He continued to be the ‘go to’ person for all forms of advice involving tradesmen, building repairs and development both at the Retreat and the North Melbourne office. Most recently Bernie has project managed the entire ‘Rehab at the Retreat Project’ which includes construction of the Physio Room, development of the swimming pool and renovations to the internal bathrooms. Together, Bernie and Gerry have been, and continue to be generous, supportive friends of Children First.